Like so many mechanical systems in our homes, air conditioners always get used when we need them but are otherwise roundly ignored ... until there’s a problem. That’s when we call a service professional and start praying that the bill won’t be too high. With air conditioners, neglecting routine maintenance leads to decreased efficiency (in other words, higher utility costs) and often, premature failure of expensive parts. To prevent this, the rule of thumb is to have your central A/C system inspected once a year by a qualified technician. 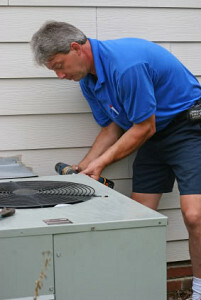 The checklist below itemizes what a routine air conditioner maintenance call should include. In addition to the annual service, it’s important to check on a couple of things every month during the cooling season. This is something you can do yourself in just a few minutes. 1. Clean the outdoor condenser coils and indoor evaporator units. The coil is made up of the refrigerant lines and surrounding radiator-like fins that line the cabinet of your outdoor A/C unit. The evaporator is the interior counterpart to the outdoor unit and has its own coil. Dirt and debris on the coils reduce efficiency and stress the system’s mechanical parts. 2. Check the refrigerant level. An incorrect amount of refrigerant makes a compressor work too hard, reducing the efficiency and longevity of the system. 3. Inspect the drain pans and condensate drains. Drains must be unobstructed and clean to ensure excess moisture is not trapped in the units or inside the house. 4. Check outdoor fan motor and blades and indoor blower assembly. The fan on the outdoor unit pulls air in through the coil fins. The indoor blower is the fan unit (motor, fan wheel and housing) on your furnace. Older blowers may include a drive belt that should be inspected and adjusted or replaced as needed. 5. Check compressor and refrigerant tubing. 6. Lubricate moving parts (as applicable). Older A/C units often have ports on fan motors, compressors and other parts for adding lubrication periodically. Newer models typically have sealed parts that don’t need to be lubed. 7. Inspect all electrical controls, wiring and connections. All electrical components and hookups should be checked for soundness, wear and damage. 8. Inspect and clean or replace air filters. A clogged filter restricts air flow to the system so that the motor runs without producing any results. Clean or change the filter as necessary. Then continue inspecting the filter every month. Using a clean filter can reduce your air conditioning costs by as much as 15 percent. 9. Run a general system test. Your technician should turn on the A/C system to check operating functions such as the starting cycle and shut-off control, check for unusual noises or odors, and measure indoor/outdoor temperatures and system pressures as needed. 10. Check ductwork for leaks and other problems. A duct inspection is not needed every year and may not be included with a standard system checkup, but air leakage in ductwork is one of the main causes of inefficiency in forced-air A/C and heating systems. It’s a good idea to have your ductwork assessed and sealed and/or insulated in problem areas, as needed. Now for a couple of things that you can do to help keep your A/C in good shape while you’re using it most: 1) Check the furnace filter each month, and replace it as soon as necessary. 2) Inspect the outdoor condenser unit and remove all leaves, grass clippings and other debris from the sides and top of the cabinet. Cut back shrubs and other vegetation as needed to maintain a minimum of 2 feet of clearance on all sides of the unit. This ensures adequate airflow to the condenser coil. The best time to call an HVAC service pro for an annual air conditioner maintenance checkup is in early spring (in most areas), or at least well before the cooling season really kicks in. If you wait until summer, the pros are booked to their fan blades with emergency repairs and installation jobs. Also be aware that some utility companies offer low-cost efficiency checkups, as well as service package plans that cover maintenance and repairs for a set monthly fee.